PHOTO CAPTIONS: 1. 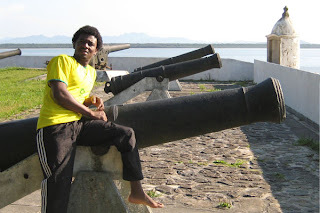 Andre at the Fortaleza, 2. Enjoying the island, 3. Beautiful empty beaches, 4. view from the lighthouse, 5. Andre played soccer with the locals, 6. 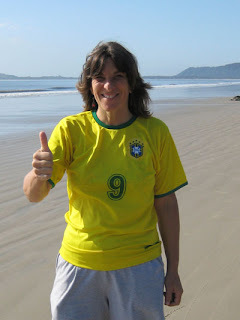 Me in a Brazilian soccer jersey, 7. 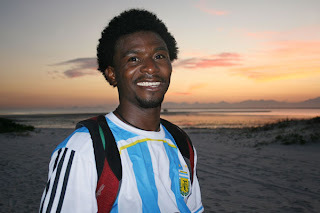 Andre in an Argentine soccer jersey, 8. 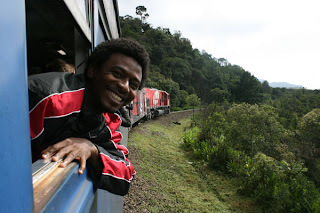 Andre enjoying the train ride from Curitiba to the coast. 9. View along the way. The train ride was fabulous. Two hours of jungle, vistas, rivers, bridges, tunnels. The route from Curitiba to the coast is very touristy so everyone was ooohing and aaahing at the windows, taking pictures and video. What a great introduction to trains for Andre. Unfortunately, they’re renovating the last segment of train tracks, so we all switched to a city bus in Morrettes. Fifty minutes, half of it standing up, wasn’t much fun. Some German girls with huge backpacks commended us on traveling with just a small rolling suitcase and daypack each, but even that feels heavy sometimes. Especially the racquetball equipment we haven’t had a chance to use yet. 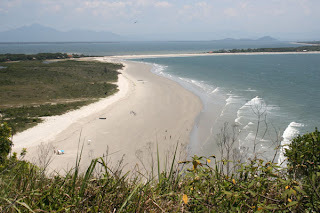 We had planned on spending time in Paranagua, but upon arrival we changed our mind and joined the other backpackers who were taking a boat to Ilha do Mel, Isla de Miel in Spanish, Isle of Honey. Andre thought 2 hours on a boat would be boring, but it was a beautiful ride too, with a refreshing breeze as we sped through the water. This is our third of I-don’t-know-how-many days on the island. I like it here, especially knowing that the Uruguay visa could take up to two weeks, meaning if we go too fast we’ll get stuck waiting at the border. 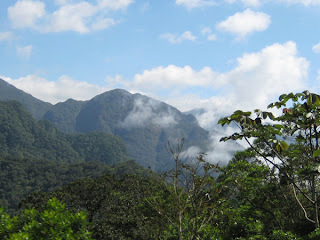 I’d rather be here where they are no cars or motorcycles, only tropical birds to wake us up in the morning. 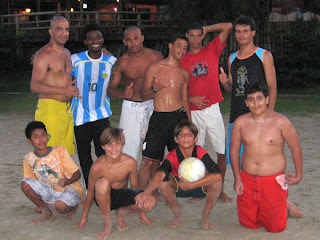 Each evening we play soccer and volleyball with the locals, who seem to be outnumbered by tourists. Luckily, the pristine beaches are still relatively empty. Summer high season starts in December, crescendoing in February. That’s when 5,000 revelers pack the island for Carnival, according to my 1989 guidebook, a gift from a friend who said don’t bother to bring it back. I suspect that number has doubled or tripled, since my guidebook also claims there is no freshwater, electricity or telephones on the island. Today there are two internet cafes that charge per minute, satellite TV, pay phones where Andre spent a small fortune to say hi to his mother in Haiti, and Pousadas (rooms to rent) at every home, plus some real hotels and a conference center. The best thing about the island, besides the beaches, is the hiking. So far we’ve walked to the Fortaleza, built in 1767 by the Portuguese to keep the French and Spanish out and climbed the stone steps up to Foral das Conchas (Lighthouse of the Shells). 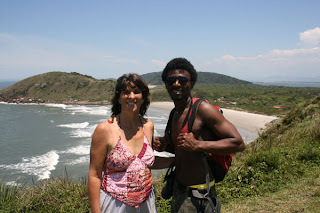 Today we’re going to Encantadas which was the first village on the island. We pass fishermen mending their nets, pushing their boats out to sea, and returning with the day’s catch. As expected, fish is delicious and cheap in the restaurants. 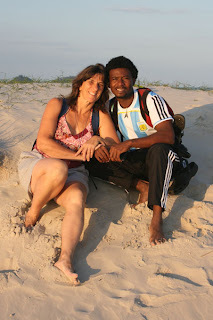 Andre noted that there are very few blacks on the island. Most of the tourists are lighter-skinned Brazilians from Curitiba and a smattering of Europeans. Good preparation for Uruguay, which is 88% white, 8% mestizo (Spanish/ Indian mix), and 4% black. Just when we’re getting the hang of Portuguese, we’ll be in Spanish-speaking countries. But we’ll be back in late December after the racquetball tournament in Bolivia until our return flight from Sao Paulo on Jan. 3. SAN DIEGO FIRE UPDATE: My dad's wife Judith just informed me that the current total losses is 10 souls and 1700 houses. If each house has 4 residents on the average, that means 6800 people have lost their homes. I feel so fortunate that my folks didn't have to evacuate.